Neck extension pain occurs when the patient looks upwards, tilting the occipital of the head towards the middle of the upper back. Neck extension should not normally be painful, but can become a torturous movement given particular circumstances. It should be noted that pain upon neck extension is far less common than pain that is suffered when the neck is rotated or when looking downward during neck flexion. Unlike the other 2 more common causes of movement-related neck pain noted above, extension-based pain typically has fewer prospective causes to consider. This can make diagnosis an easier process for these patients. However, one must still take an active role in the diagnostic and treatment process in order to improve the chances for a positive therapeutic result and minimize the chances for misdiagnosis and treatment disappointments. 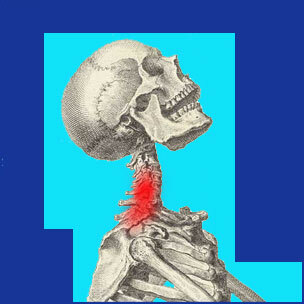 This essay delves into the incidence of extension-related neck pain. We will examine the symptoms, causes and treatments for this rather rare problem and provide some valuable facts that every patients should know. Pain during neck extension occurs when the patient looks upwards, bringing the rear of their skull down towards the center of their shoulder blades. Typically, the pain occurs directly at the apex of the cervical spinal lordotic curvature, near C4/C5. Less often, the pain exists near the cervicothoracic juncture. The discomfort is most often centered on the spine, but can also exist on one side or both, off center to varying degrees. Pain may be sharp, localized and experienced only during the sensitive range of motion or pain may be dull and widespread. The first variety of expression is certainly more often seen by clinical medical practitioners, with patients complaining of acute pain in a specific area upon extension of the neck. Some patients might also demonstrate feelings or actual expressions of weakness in the neck muscles, especially upon extension. A minority of patients might suffer neurological symptoms of tingling, pain or numbness into the upper back or into one or both arms upon looking up. Most cases of cervical region pain when extending the neck are caused by muscular strain or imbalances in neck muscle symmetry. Many patients have suffered an injury, such as whiplash or other type of muscular trauma. Some patients are also suffering from a more acute primary pain syndrome, such as flexion-related pain, with the extension-based pain being less severe. Rarely, muscular imbalances might cause tightness and shortness in the some of the neck muscles which might lead to extension-based pain, but this is seen far less frequently than imbalances that cause flexion-related pain. A fair number of patients who suffer pain while looking upwards will have structural spinal issues that are exacerbated by this particular movement. These issues can range from facet joint arthrosis to herniated discs to cervical scoliosis, hypolordosis or hyperlordosis. It is also possible that the cause could be related to cervical spondylolisthesis, and we have seen a few cases of cervical retrolisthesis that were aggravated by extension of the neck. Some neck extension pain problems might be psychogenic in nature. It is common for tension myositis to create structurally illogical symptoms in some patients and we have seen virtually every type of trigger mechanism utilized by these ischemia syndromes. Given the lack of a definitive structural or muscular causation, the majority of idiopathic extension-based symptomologies most likely fall under this causation, but proper diagnostic evaluation can ascertain this classification in most sufferers when the caregiver is trained in mindbody healthcare. Virtually all of the movement-related neck pain syndromes will resolve organically without any medical intervention. Typically, this takes a few days to a couple of weeks in most patients. Some amount of residual pain and stiffness may endure for longer, particularly in cases of known, severe neck trauma, such as whiplash. For pain that persists or is extreme in nature, we recommend seeking diagnostic evaluation from both a neurologist and a physical therapist. Ideally, these doctors should not work together or have prior knowledge of the other’s diagnostic opinions for the most objective results. Muscular issues rarely require professional intervention, although some may take time to resolve. Structural spinal issues occasionally require treatment and even less often might be indicated for surgical correction. However, when the ideal circumstances exist, targeted surgery can relieve these pain problems when the diagnosis is sound and the procedure goes well. Conservative methods of care are usually optional and symptomatic in nature, such as physical therapy, chiropractic, acupuncture or massage. For patients with chronic or recurrent pain syndromes that defy diagnosis and treatment, the cause might be of mindbody origin. Remember that these types of pain problems are universally experienced in humans and will not respond well to any type of physically-based treatment. However, knowledge therapy techniques will usually be able to undermine the symptom imperative and end these expressions permanently. All it takes is the simple subconscious recognition of the underlying emotional state responsible for enacting the symptoms. In unusual cases such as extension-related neck pain, the percentage of patients who are actually suffering from mindbody-enacted variants is high.